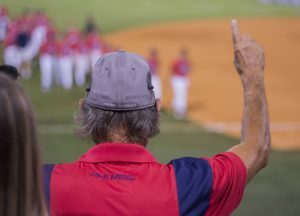 As fans waited in line to pile into Swayze, Coach Bianco and the Rebels (48-15) knew the task at hand was not going to be easy facing the Tennessee Tech Golden Eagles. The Ohio Valley Conference Champions have recorded not only the most home runs but also the most hits, highest batting average and most importantly, most wins in the country. In their starting lineup, there is not one player who bats below .300. Through finding gaps in the defense and situation awareness, the Golden Eagles have earned a 49-9 record and a 29 game win streak. The crowd at Swayze was a sellout and electric from the start when Oxford native and shortstop, Grae Kessinger, took the first pitch from the right-handed junior, Marcus Evey, to right-center. The Rebels took a quick lead 2-0 to start the game. Brady Feigl jumped on a shaky start from Tennessee Tech, however, back-to-back solo home runs in the 3rd from Osborne and Kalewahea, silenced the Swayze crowd and demonstrated how quickly the Ohio Valley Champions could hop back into a game. A series of hits from Ryan Olenek, Nick Fortes, and Will Golsan helped drive in two runs in the top of the 5th inning to take the lead back for the Rebels. Swayze regained life and momentum once again. The Golden Eagles did not take long to answer. Chalking up two more runs on multiple hits, Tennessee Tech continued to pressure the Rebels by tying the ballgame up at 4-4. After trading off runs in the bottom of the 6th, Brady Feigl’s day ended with 8 strikeouts and 4 runs allowed Will Ethridge relieved Feigl of his duties and escaped a wild 6th inning with two Tennessee Tech base runners on. The anxiety-filled student section looked to their coolers and refilled their cups to calm their nerves tied at 5-5. A passed ball on a Tim Rowe strikeout gave the Rebels an opportunity to strike with pinch-runner Anthony Servideo. Servideo, who was an integral al part of the SEC Tournament Championship game win, delivered again when his number was called upon. Tied at 5 in the 6th inning, Grae Kessinger electrified Swayze with a zinger to left and sends Servideo sliding into home for the Rebel lead. With a one-run lead in the bottom of the 8th, Ole Miss’s captain and leader Will Golsan made the defensive play of the game with two outs by diving head first to snag a line drive to left-center field to end the inning. Even with extending the Rebels lead in the top of 9th, the atmosphere grew tense inside Swayze even with the score 9-5. Tennessee Tech was not done battling and was relentless to quit as they tallied three quick runs. The Ole Miss faithful nervously stood and watched Houston Roth approach the mound in relief of Parker Caracci and Greer Holston. The score was 9 to 8 with two runners on, two outs and two strikes. All Roth needed to do was to deliver one more clutch pitch and the Rebs would advance to the region final. 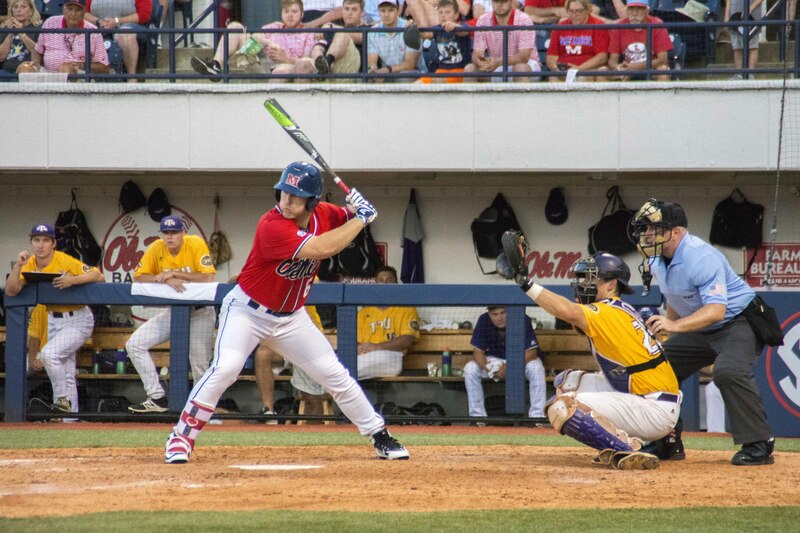 The Ole Miss fan base at Swayze Field, which was once thunderous sounding, was nervous, as they had seen the situational batting expertise of the Golden Eagle’s all game long. The sold-out crowd held their breath as Roth delivered the pitch. The next two sounds were the smack of the glove and a sigh of relief from the Swayze crowd. Leaving leadoff hitter, Alex Junior, swinging, Houston Roth advanced the Rebels the Regional championship. Ole Miss is now one win away from hosting a Super Regional versus the University of Texas next weekend in Oxford.